One of the things I love about France (other than the cheese and wine obviously) is that it keeps surprising me. 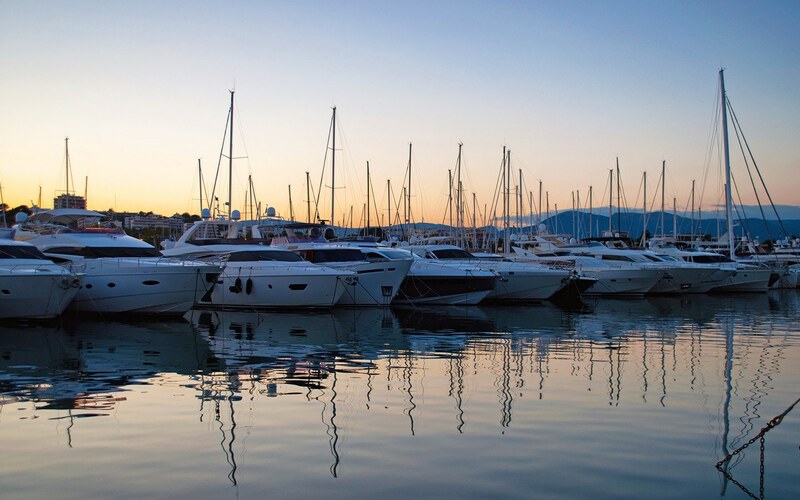 I thought I knew the Côte d’Azur – millionaires’ coastal villas, exclusive boutiques, casinos, luxury yachts – but Antibes wasn’t what I expected. Instead there was this 16th-century historic walled town, with red-roofed buildings and waves crashing against the ramparts. With sandy beaches on each side and the blue of the Mediterranean it was as pretty as a postcard. Judging by size of the yachts in the harbour there’s plenty of money about, but you don’t need a second mortgage to eat, drink or shop in Antibes. 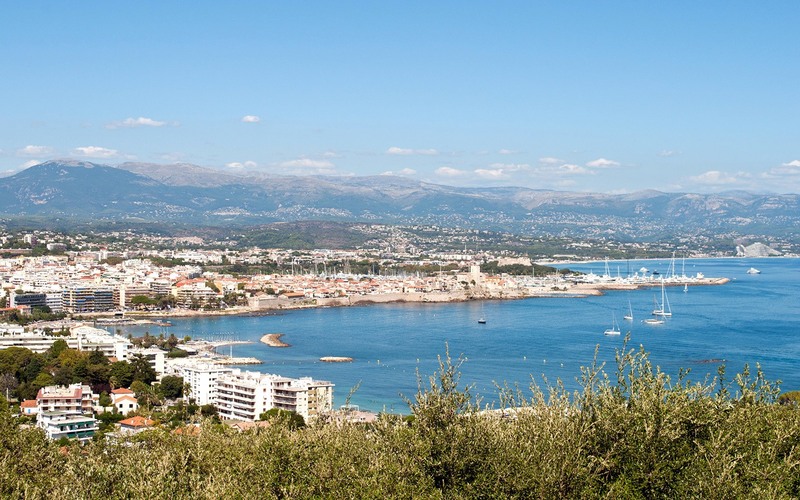 You also get two-for-one when you visit Antibes, as it’s just a walk across the headland to neighbouring Juan-les-Pins, an art-deco style beach resort. 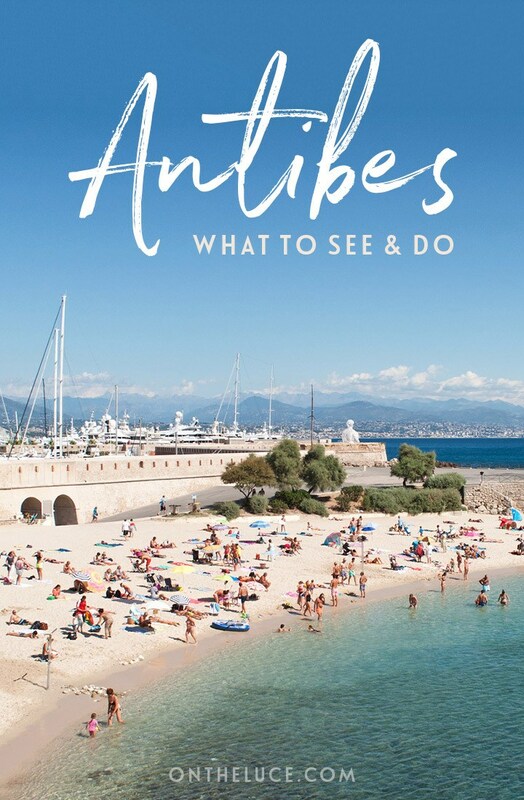 So here are some of my favourite things to do in Antibes. Within the stone ramparts, the old town of Vieil Antibes looks like it hasn’t changed much for centuries. 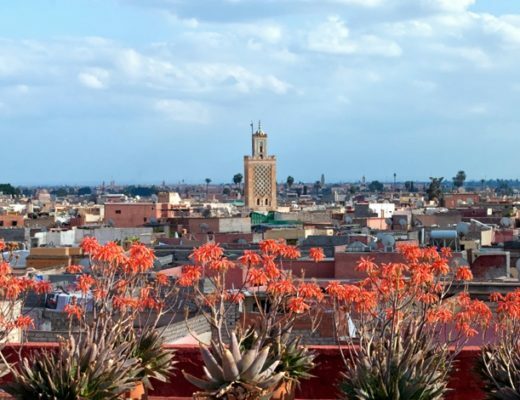 It’s a maze of narrow cobbled streets, overlooked by pastel-coloured buildings with brightly painted shutters. 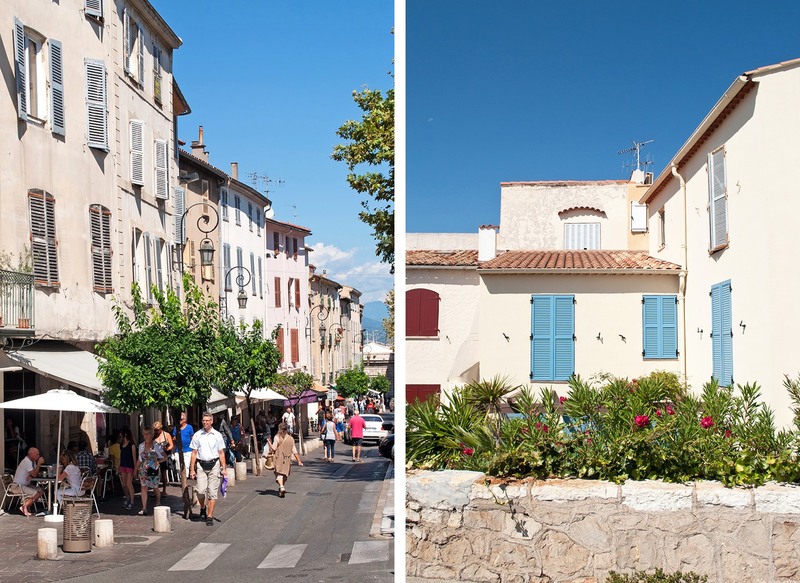 Antibes’ old town has pavement cafés and restaurants mixed with shops selling local gifts like white cotton clothes, glassware, local artworks and herbs. Don’t miss the Marché Provençal (6am–1pm daily June–September, and every day except Monday the rest of the year), where traders from around Provence bring fresh produce to sell – fruit and vegetables, cheeses, olives and charcuterie. And there’s a path along the edge of the ramparts so you can walk from the harbour to the southern beaches along the water’s edge. 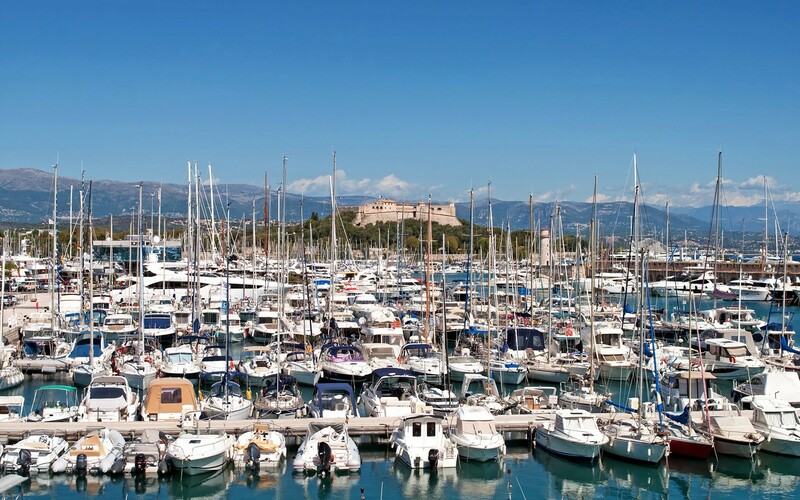 Packed with 1800 boats, Antibes’ Port Vauban is the Mediterranean’s largest marina – and with mooring fees of over a million euros it’s probably one of the most profitable too. 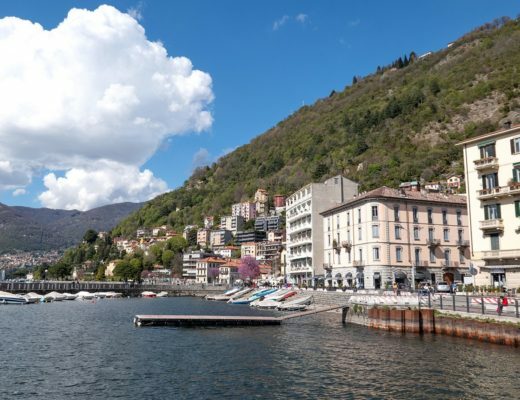 This natural harbour has been used since Roman times, but today it’s full of some of the world’s most expensive yachts. If you want a taste of the millionaire lifestyle, you can charter one for the day – there’s everything from small boats to €6000 a day, 12-person superyachts with crew for hire. If that sounds a bit pricey, you can take a walk along the edge of the harbour and do a bit of fantasy yacht shopping instead. Between the harbour and nearby Fort Carré there’s an area known as Billionaires’ Quay. Here you’ll see uniformed crew polishing the railings of the superyachts belonging to an ultra-rich list of oligarchs, sheikhs and royalty. 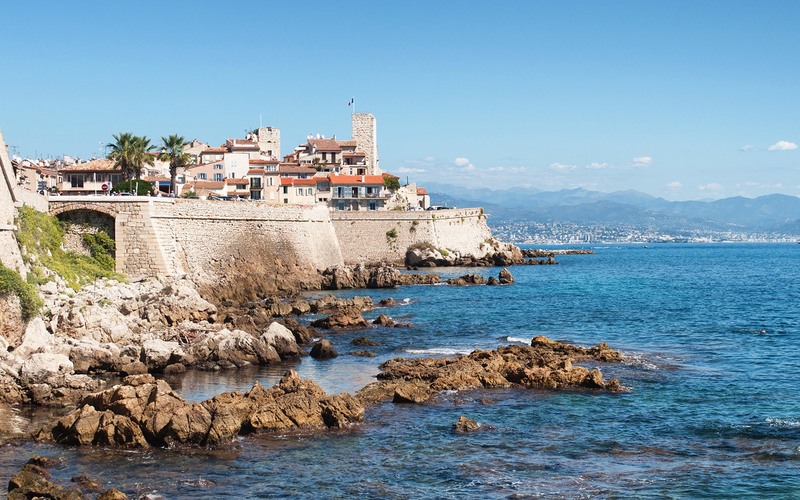 Antibes is surrounded by beautiful beaches, and unlike a lot of the pebbly Côte d’Azur there’s plenty of golden sand with its clear turquoise waters. Closest to town is Plage de la Gravette, accessed though an archway from the port and overlooked by the old town ramparts. The sheltered cove is perfect for swimming, or join the locals for aperitifs on the beach at sunset. Just south of town are a couple more sandy stretches – Plage de Ponteil, next to the Antibes Yacht Club where you can hire boats or kayaks, and Plage de la Salis. Both have shallow water and lifeguards on duty in the summer. Further south again is Plage de la Garoupe, home to luxury private beach clubs in summer, where you can hire a lounger with drinks service – just don’t go boasting about it on social media, as the beach has enforced a selfie ban! Antibes has been an inspiration to artists right back to Monet’s 1888 painting of the Cap d’Antibes. One of the town’s most famous artistic residents was Picasso, who lived in Château Grimaldi for six months in 1946. 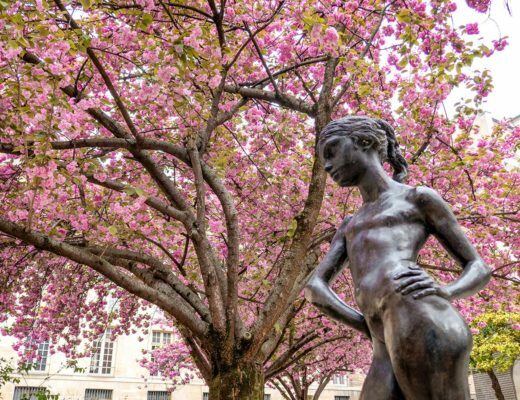 The building was later turned into the Musée Picasso and shows his paintings, drawings and ceramics along with works from other contemporary artists. 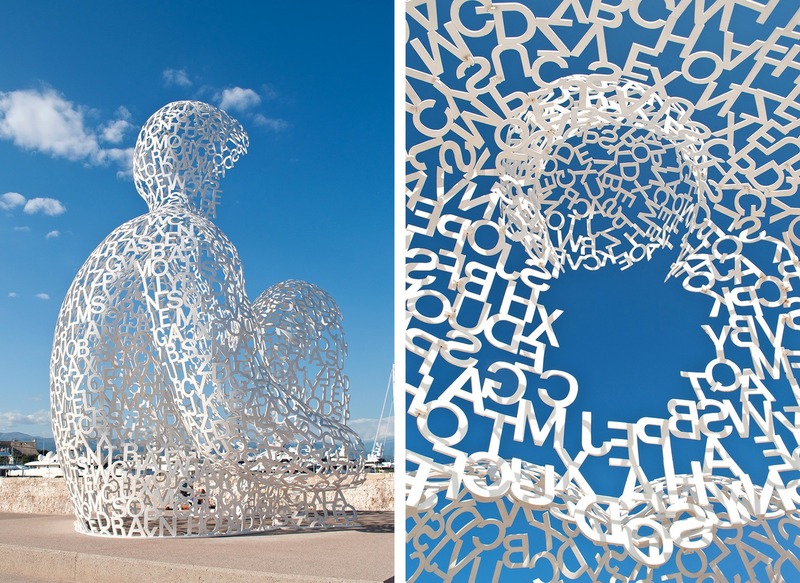 One of the museum’s previous exhibits has found a permanent home on Saint-Jaume bastion – Nomade by Catalan artist Jaume Plensa. A giant figure made up of different letters sits on the ramparts looking out to sea. On a sunny day the white letters contrast against the deep blue sky, and at night it’s lit up from inside. Or if you’re interested in what Antibes’ artists are creating today, there are studios in the city walls where you can check out their latest work. 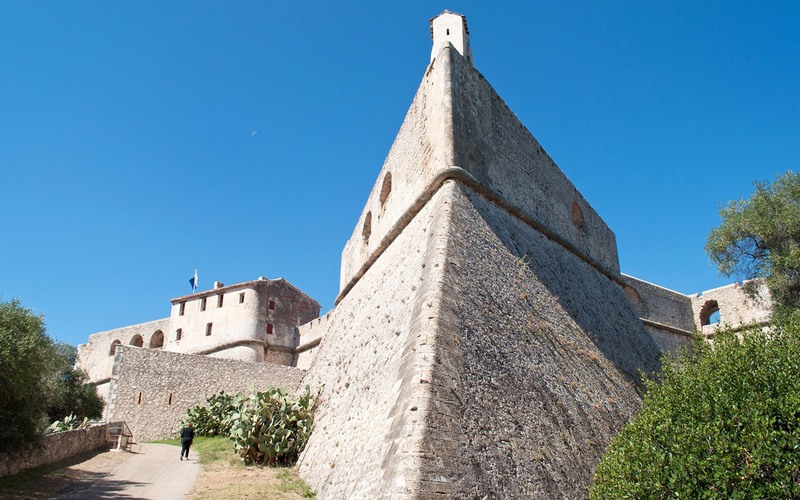 Fort Carré was built in the 16th century to protect the border between France and the neighbouring county of Nice and saw its share of battles. After Nice became part of France it was declassified and used as a sports college for soldiers, who used to abseil down its walls, before opening to visitors. It’s claim to fame is that Napoleon was imprisoned there during the French Revolution, but you might recognise it as the villain’s lair from Bond film Never Say Never Again. Fort Carré means square fort, but it’s actually star-shaped after military architect Vauban added extra defensive walls. It’s not until you get up close (unless you’re arriving by helicopter) that you can see the four pointed bastions. The inside is mostly empty but the walls are a perfect vantage point, with Antibes on one side and Nice across the Baie des Anges on the other. For a panoramic view of the Côte d’Azur, head up the Chemin de Calvaire pathway behind Plage de la Salis to the Garoupe Lighthouse. The path is a kilometre long and leads up a stony pathway through pine forests before emerging at the top. In one direction you can see Juan-les-Pins and Cannes, and in the other there’s Nice, Villefranche-sur-Mer and Italy. The lighthouse is one of the most powerful in France, but isn’t open to the public since it became automated. You can visit the 16th-century chapel of Notre-Dame-de-la-Garoupe though, an old pilgrimage site surrounded by picnic benches and with a café selling drinks in summer. Looking for somewhere to stay in Antibes? I was there last summer, and it really surprised me how beautiful Antibes is. It reminded me of small towns on the islands in my own country – Croatia so I really felt like home. Such a beautiful place – interesting that it reminded you of Croatia too, I’m hoping to explore some more of the islands there next year. I love how blue all your lovely photos are, it looks so pretty! I like the sound of that no-selfie beach, brilliant! Did you go to Juan-les-Pins? I’m a fan of Art Deco and this sounds just my cup of deco tea! The yachts were crazy, we looked up the prices of some and have never seen so many zeroes! Away from that the city was surprisingly affordable though, and lots to do even if you don’t have a yacht. I’ve never visited the south of France (shame on me) but it looks beautiful and not how I’d imagined at all. The old fort and harbour reminded me a little of Budva, Montenegro. Yes there’s definitely something of the Balkans about the old town area! The South of France is much more mixed than I imagined – lots of beach resorts but some more historic towns and some lovely places up in the hills too. I’ve never been to Antibes even though we’ve been to the south of France several times. We have friends who go there every summer and they’ve always raved about it. Now, I can see why! I’d been to the South of France a couple of times but think Antibes was my favourite place so far – loved the mix of old town and beaches. 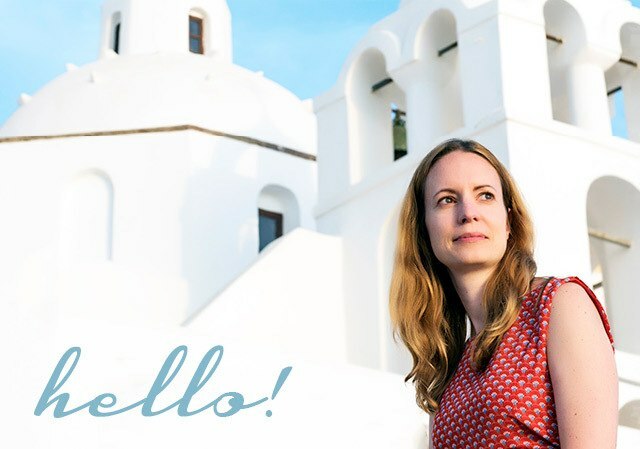 I have to say I was very surprised to see how interesting and lovely it is in Antibes – a place I would never have considered visiting before I saw your lovely photos and description! 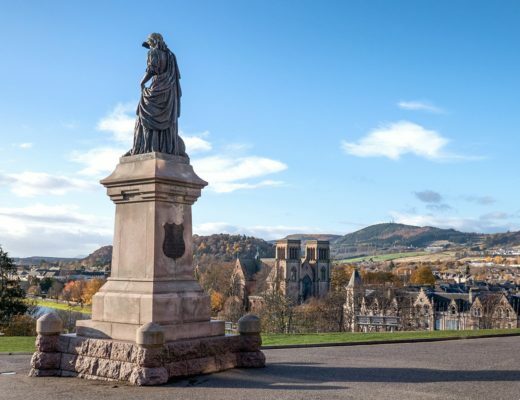 It’s a really lovely spot – though the beautiful weather definitely helped too! 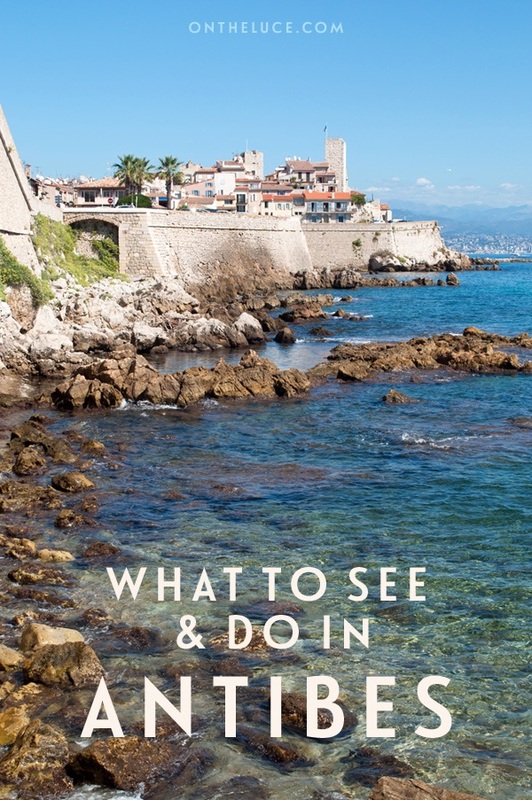 You’ve captured a lot of what Antibes has to offer (and there’s even more!!) I agree with you that it’s not all about billionaires and their yachts, did you know it even has a self-governing free commune right in the heart of the old town? I live near by and love exploring its different areas and hiking the Cap. I’d love it if you’d like to link this up to my monthly blog linky #AllAboutFrance which is on the 1st Thursday of each month, ie happening again this Thursday (1st Oct). You can find out more in the sidebar of my blog. Thanks Phoebe, I didn’t know about the self-governing commune, very interesting. The #AllAboutFrance link up sounds good, I am on the road again as of tomorrow but will join in when I’m back! Now I really want to go there!! Not too far from Spain! It really was a nice surprise, perfect for a few relaxing days. Wonderful buildings and scenery! I’ve been to the Côte d’Azur and I was awfully impressed. Who isn’t? I’d love to again! I’m the other way around with languages – my French is ok but my Spanish is hopeless, so I’ve been known to try a bit of French in Spain! Would definitely recommend a return trip to Antibes, there’s a lot to see and it’s such a beautiful place. When in Antibes, you have got to go to the Absinthe Bar! Thanks for the tip – will check it out next time! I just was married in Juan-les-Pins and we stayed next to the Plage Salis in Antibes. Such wonderful little towns. They are extremely affordable and absolutely stunning. I can’t wait to go back! What a lovely place to get married! Love that part of France, such beautiful scenery. If you like history and archeology you also have the museum of archeology in the “bastion saint andré”. 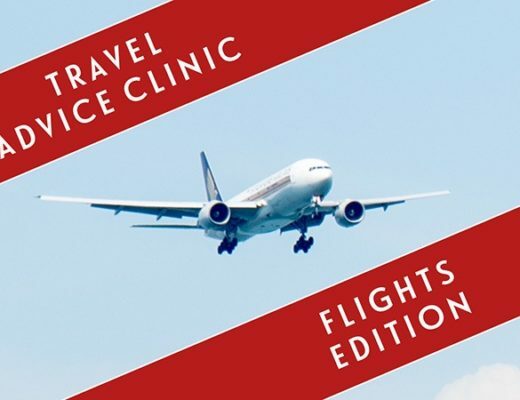 Thanks for the tip, sounds great and I’ll make sure to check it out next time I’m in Antibes! Antibes is the beautiful place to visit. Thanks for sharing the blog and tip. Thanks it’s a lovely place! I love Antibes, it’s such a beautiful place and the beach is definitely one of my favourites in the Côte d’Azur; I agree the sand is a nice change from the pebbles on most of the other beaches. I can’t wait to go back next year! It’s such a lovely place! I can definitely see why you want to go back.